And now we come to one of the first members of the Lost March attack itself, and go figure he’s the small cute one! Don’t worry, you’ll meet the other one soon enough. And if you don’t know by now, they are also cute. Natu is a Basic Psychic Pokemon, 40 HP, with a Psychic Weakness, no Resistance, and a Retreat Cost of 1. Lost March is the only move he’s got, which for 2 Energy of any kind will deal 20 damage for every Pokemon in the Lost Zone, except for Pokemon <Prism>. Now that we’ve covered the basic function of the deck, you can understand why cards like Lost Blender and Trumbeak are so big for the deck. Without them, the attacks wouldn’t really do much. With a Lost Blender and a Trumbeak, Lost March can start out at 60 damage, which is a bit average for 20 damage, but if it can be built similarly to Night March decks, there are a number of ways to let those cards appear often enough in your hand so that you can use them a lot to power it up really fast. And with DCE, Natu can attack with it right away! It’s not a foolproof plan – Natu itself is extremely vulnerable until you can get fully set-up, but if Joltik was anything to go by, it shouldn’t be a problem. Not to mention you don’t have to worry about getting specific Pokemon into the Lost Zone, cause any Pokemon will do! And once you’re set-up with enough Pokemon to dish out a ton of damage – about 13 will put you into OHKO range on anything in the game, and Lost Blender/Trumbeak can cover most of that – Natu will be in pretty good condition to tear through the competition! Arora Notealus: Such small Pokemon, such dangerously powerful attacks. Next Time: And now for the last two members of the Lost March archetype! Natu is one of the two Lost March attackers. At first, I thought it would be easier to put both Natu and Jumpluff in the same review, but I failed to realize that they don’t have to belong in the same deck because it doesn’t restrict Pokémon with just the Lost March attack (unlike Night March). However, it will be better if you combined those into one deck. The attack cost of Lost March for Natu is CC, which can be a splashable attacker, but as 21times pointed out, Jumpluff is probably going to be the attacker more often than Natu due to its single Grass energy attack cost. That’s not to say that Natu is inferior, although you would have to make room for Double Colorless Energy. It’s Psychic typing can help against some Fighting and Psychic types such as Buzzwole variants and Malamar. For Expanded, Dimensional Valley can help shave off one of the attack costs, bringing it down from CC to C. Rainbow Energy puts one damage counter on Natu, bringing it down to 30 HP. And you know what this means. Hustle Belt will drastically help Natu become a wallbreaker! Natu (LOT 87) chirps its way into the Pokemon Trading Card Game from the Lost Thunder expansion set. This 40 HP Basic Psychic Pokemon has one attack: Lost March. Yes, it’s the reincarnation of Night March, only pointing to the Lost Zone and not the discard pile. Lost March, for a Double Colorless Energy, does twenty damage for every Pokemon you place into the Lost Zone. I think it’s a safe assumption to say that you all know what the Lost March archetype is all about. If you don’t, I’m going to guess that one of the other reviewers today will detail it out, so I’m just going to give you some of the stats I’ve mined out of the sixty plus games I’ve played with Lost March already. Overall, I’ve played Natu at a 38% rate. That means 38% of all the Natus I run have been placed into play. On average, that means I’ve played Natu 1.5 times per game. In comparison, I’ve played Jumpluff an average of 2 times per game. Whether I win or lose doesn’t matter, it’s the same 1.5 average regardless of the outcome of the game. I average playing one DCE per game. Whether I win or lose as well, this average stays the same. This is why in my most recent builds, I’m dropping down to three Natu and three DCE. Most decks are carrying more Grass energy than DCE, so it’s just easier to find the Grass than the DCE, especially with Net Ball. You have to get at least two if not three Jumpluff into the game. The rhythm for me is that I generally lose a Dunsparce or Vulpix first, so I know I’m only going to need five attackers. I make more effort to attack with Natu if I’m going up against a Psychic weak Pokemon, but if I can get three Jumpluff into the game then I know I only need two Natu at most. Therefore, how many Jumpluff I can get onto the board drives how many Natu I know I’ll need, and usually that means I can spare a Natu or two…. Which means you’re more likely to Ultra Ball or Blend a Natu than a Hoppip. I’m not going to say that I won’t ever Blend one of the Jumpluff line, but I guarantee you I’ve blended Natu WAY more than I’ve blended Hoppip. As I mentioned, I get Grass energy a lot more easily than DCE, so I probably attack more with Jumpluff early on. A lot of times if I get set up well early, my opponent just concedes. We know that’s how PTCGO works – if you get stuck early, your opponent has a great start, it’s a rough matchup for you to begin with, it’s real easy to click that concede button before a Natu even hits the bench. Natu is a nice balance to Jumpluff, and it helps make the deck extremely effective. If Jumpluff were the only attacker with Lost March, this would only be a novelty deck. 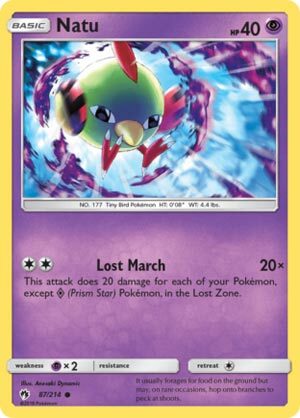 Make no mistake: the Lost March archetype needs Natu. It’s just that Natu is the number two guy, the Scottie Pippin, the Clay Thompson, the Raheem Sterling. He’s more than capable of getting the job done, he’s just not the star of the show. Our usual Top 10 Countdown ended up as a convoluted Top 11, with two cards in support of the Lost March archetype lumped in with the actual Lost March Pokémon themselves… and we’re finally looking at one: Natu (SM – Lost March 87/214). This is a Basic [P] Type Pokémon with 40 HP, [P] Weakness, no Resistance, Retreat Cost [C] and the “Lost March” attack for [CC], doing 20 damage for each of your Pokémon in the Lost Zone (Prism Star Pokémon excluded). Being a Basic is great. Being a [P] doesn’t really matter in Standard (but it might in Expanded). The 40 HP is terrible, the second lowest printed on an actual Pokémon; almost anything can reliably KO it while it is in the Active Position, and it may not even survive a turn on the Bench in the wake of spread attacks or Bench hits. The [P] Weakness barely matters, just making an already almost certain OHKO even more likely. The lack of Resistance is the worst but with only 40 HP it wasn’t going to do a lot of good. A Retreat Cost of [C] is normally good, and technically remains so here, but if your opponent forces Natu into the Active spot it is probably for a OHKO, and when something is this small, I guess I just prefer it be able to retreat for free. So, is Lost March a good attack? Yes, I’d say so. As long as Double Colorless Energy is legal, seems like [CC] is a great and easy to pay attack cost, not unlike how it is on Zoroark-GX for its “Riotous Beating” or – and this is probably the more appropriate comparison – the “Night March” attack found on Joltik (XY – Phantom Forces 26/119). Besides attack costs on small Basics, the decks do have a similar approach; toss Pokémon to another zone (the discard pile for Night March or the Lost Zone for Lost March) to create some potent glass cannons capable of OHKOing nearly anything in the metagame. Night March only works with Pokémon that have the Night March attack, while Lost March only cares that the Pokémon sent to the Lost Zone aren’t Prism Stars. If it was as easy to add Pokémon to the Lost Zone as it is for Standard decks right now to send them to the discard pile, Lost March would easily be the best deck you could run right now. After all, unlike Night March and other discard pile-based attacks, there’s no way for either player to return cards from the Lost Zone to another zone, nor do I recall there being any attackers that specifically punish a player for having a lot of cards in the Lost Zone. Instead, the limiting factor is that we have a short list of cards that can send your own Pokémon to the Lost Zone. Lost Blender and Trumbeak are relatively easy to use, though always having two Pokémon two spare for the Lost Zone can sometimes be a tall order. Trumbeak can’t let you down unless something is shutting down the Abilities of Pokémon in your hand (I believe that is an Expanded-only concern). Skiploom has an Ability which sends it and all cards attached to itself to your Lost Zone in order to Bench a Jumpluff from your deck but the wording is such that if you whiff on a Jumpluff, Skiploom stays where it is at. It is also a small Stage 1 which Evolves from an even smaller Basic so either is vulnerable until you can pull it off. Spinarak is the one the competitive decks seem to avoid and I’m a little torn about it myself. Its “Spider Scram” attack needs [G] to use and both Paralyzes and Poisons the opponent’s Active before sending Spinarak and all cards attached to it in your Lost Zone. If you could afford to spare an attack it’d be solid, as the other Lost March attacker – Jumpluff 14/214) needs [G] to attack as well. If every single card in the list we just mentioned works as planned, that’s up to 24 Pokémon you could send to your Lost Zone. 480 damage is going to clobber anything lacking insane protection but between stuff being Prized, KO’d negated, poorly timed etc. you just cannot count on that much… and that is 20 Pokémon in your deck before Natu, before non-Trainer draw or search effects and anything else most decks run. Even if everything is available, pulling it all off ASAP isn’t likely; you’ll probably have at least a turn or two where you whiff on the OHKO and several before you’re swinging big. Which doesn’t mean Lost March cannot work, but it does mean that Natu will probably have to be used alongside most of that support. With cards like Rescue Stretcher, recycling KO’d Natu isn’t hard. Counter Energy might be able to join Double Colorless Energy so you could still attack for a single Energy six total times; in Expanded, you could use Dimension Valley to lower the cost to just [C] and/or Mew (XY – Fates Collide 29/124) for additional glass cannons. We get a few more semi-generic options like Lost Blender and Trumbeak, and we might have to start specifying “Lost March – Natu”, “Lost March – Jumpluff”, or “Lost March – Full”. If we see more and more effects that send your opponent’s Pokémon to the Lost Zone, Natu may have use as a surprise counter to such decks. Your opponent tries to wreck your main strategy, but if they miss Natu you’ve got at least one hard hitter on a budget. For now, though, only use Natu alongside Jumpluff… and I’m not sure which is the better attacker. Natu as Double Colorless Energy while Jumpluff has Net Ball. While I haven’t been testing this deck and I’ve barely faced it on the PTCGO, early tournament results show its… okay. I still don’t have complete results from the Sao Paulo tournament this past weekend, but what I do have shows a single Lost March deck that managed a 61st place finish in a tournament with 630 players. Maybe the deck wasn’t heavily used and so a little bad luck kept that player down, maybe some of the gaps in the data are Lost March decks, but it looks like it is not the new hotness as so many of us predicted. That being said, from what I have seen it looks like a fun deck that is competitive, just not top tier competitive. If you can’t take enough Prizes before it gets going, though, it’ll fake being one of the greats quite easily; single Prize attackers hitting hard enough to OHKO Stage 2 Pokémon-GX! I’m quite curious how it would fair in Expanded; it is slower than Night March but doesn’t really care about Karen and (maybe) not even Oricorio (SM – Guardians Rising 56/145; SM – Black Star Promos SM19) is as scary – you still are likely to have several low HP Pokémon in play, but very few in your discard pile to feed its “Supernatural Dance” attack. If your build includes either Spinarak or Skiploom, Ditto (BW – Boundaries Crossed 108/149) and/or Klefki (XY – Steam Siege 80/114) can actually be tacked onto the pile of cards removed by their effects. If it wasn’t for the massive amount of competition, and the risk of Abilities being shut off, I’d actually have higher expectations of Lost March here than in Standard. For the Limited Format, it is all about whether you pulled any other cards that can fuel Lost March. If you didn’t, it’s all but worthless filler, but if you can get at least three Pokémon into your Lost Zone, it’ll be “okay” upwards to “amazing”. Natu is yet another card that could become obscene with future hypothetical releases, but with what we know is on the docket and what we have, is just “alright” thanks to being fairly good in one okay deck, and maybe a future niche as a counter to decks that remove their opponent’s Pokémon. Oh, and the Limited Score is so low because I don’t like the odds of you actually pulling, then drawing into, the cards you’d need to get even a few Pokémon into your Lost Zone. If SM – Lost Thunder boosters are more “generous” with these than I realized, please adjust accordingly.